Submitted to Washington Post just before Christmas 2016. Nearly made it, but eventually missed out, The message for science is sadly stark. “Are you now, or have you ever been, a climate scientist?” Donald Trump’s recent demand that the Department of Energy provide the names of all staff who have been involved in climate research smacks of McCarthyist paranoia, but this worrying aspect of his forthcoming Presidency does not have its roots in American history. As with some other well-publicized concerns, its roots lie in Russia – in this case, in the sad history of Trofim Denisovich Lysenko. Lysenko was the Soviet Union’s most powerful biologist in the 1940s and 1950s. He aimed to get peasants back to the land, and to use science to improve crop yields. Unfortunately for Soviet agriculture, his “science” was not the evidence-based genetic science of the West, but a belief in “environmentally acquired inheritance” that had no basis in fact. No matter. The fact that really counted was the support of Joseph Stalin. Scientific opposition was overcome, not with argument, but by denouncing opponents, removing them from their positions, and destroying their careers. Such an approach spelled disaster for Soviet agriculture, and promises to spell disaster in the present day if it is allowed to flourish. The difference is that, this time, the whole world is involved. By 1948, scientific dissent from Lysenko’s theories had been outlawed in the Soviet Union, even though the vast majority of Soviet biologists, with increasing (if surreptitious) access to Western publications, knew that those theories were nonsense. The theory that human-induced climate change is not real is likewise nonsense. It is a theory that is only held by those who do not wish to face facts. Those facts, such as record atmospheric carbon dioxide levels and inexorably increasing global temperatures, speak for themselves. We are already in a situation where the 1.5C temperature increase that was the center of the Paris agreement seems to be an absurdly optimistic goal. It is almost sure to be exceeded, although we don’t know where, and we don’t know when. This uncertainty has been taken as an opportunity by today’s climate change Lysenkoists. Like the cigarette manufacturers who refused to accept the increasingly obvious link between smoking and lung cancer in the 1960s and 1970s, the new Lysenkoists will grab on to any expression of uncertainty to justify their self-interested beliefs. They include, but are not limited to, the representatives of the fossil fuel industry and their political allies. Their pernicious influence is not just confined to the U.S. In my own country of Australia, for example, the Government has been lobbying strongly for more Chinese purchases of coal, and is also about to advance a loan of $Aus 1 billion for the establishment of a giant new coal mine near the already-threatened Great Barrier Reef. A second, major problem is the one that game theorists refer to as The Tragedy of the Commons. Dealing with a major issue like man-made global warming requires man-made global cooperation. As Donald Trump has recognized, however, individual nations can gain over the rest by refusing to cooperate, and pursuing their own short-term economic interests instead – justifying the failure to cooperate in this case by not accepting that the problem is real. The Tragedy comes when other nations also refuse to cooperate. In game theory parlance, they “cheat,” and when a sufficient number cheat, everyone ends up worse off than if they had cooperated in the first place. This is what is now happening as the new Lysenkoists gain control in the U.S. and elsewhere, suppressing opposition and bulldozing inconvenient facts into the ground. The vast majority of today’s scientists who have examined those facts are frightened. Frightened because of the potentially damaging effects on the world as a whole, and especially frightened for the future of our children and grandchildren. 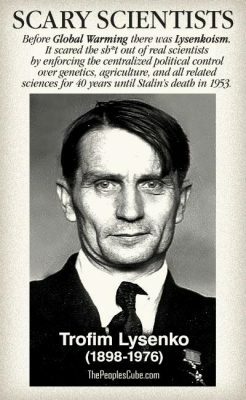 Trofim Lysenko is now a disgraced non-person in Soviet history, interred in the same cemetery as the British traitor Kim Philby. The damage that Lysenko did to Soviet agriculture is still being felt to this day. The damage that the new Lysenkoists could do to our world, where everything is connected to everything else – economically, socially and ecologically – defies the imagination. With the future of that world in mind, surely it is time for them to change course before it is too late, and to avoid sharing Lysenko’s ultimate reputation by facing facts and showing real statesmanship in a world that sorely needs it, rather than being traitors to our future.